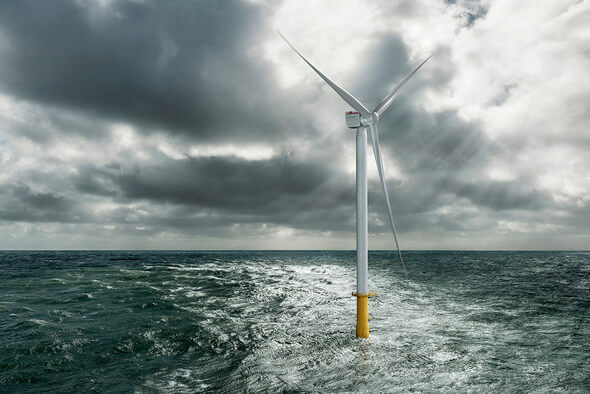 Siemens Gamesa and Vattenfall have agreed to install 76 of the new SG 10.0-193 DD offshore wind turbines in the Hollandse Kust Zuid (HKZ) 1&2 offshore wind farm. This was announced by both companies. Should Vattenfall also win the tender for the construction of Hollandse Kust Zuid 3&4, this turbine type would also be erected there. The project would then comprise a total of 152 wind turbines. The new wind turbines to be used in the North Sea will have a 30 percent increase in energy yield, which is an enormous development for the offshore wind industry. The length of a rotor blade is 94 meters, which is about the length of a football field. "This is a very important development for us," says Gunnar Groebler, Head of Business Area Wind at Vattenfall. "We are proud to be working with Siemens Gamesa, the company is a strong and reliable partner in other projects and we look forward to extending our cooperation to Hollandse Kust Zuid. With this type of turbine, the Hollandse Kust Zuid 1&2 wind farm is expected to produce an annual amount of electricity equivalent to the annual demand of up to 1.5 million Dutch households. The first offshore work for this project has already begun. The wind farm is to be completed by 2023 at the latest.